When the Rev. Peter Sawtell gets to the part of his sermon on what older generations owe to the youth, the audience exhales. "There's usually an audible 'ooooof' out of the congregation," said Sawtell, director of Eco-Justice Ministries in Denver. It's an acknowledgment that past generations have saddled young people with a massive problem. In the sermon, Sawtell talks of climate change and ecological stability, focusing significant time on what Earth will resemble in the future. He also talks about a group of young people fighting to protect the planet — the plaintiffs of a federal climate lawsuit against the U.S. government. Twenty-one young Americans are suing the government over climate change. Click here to view the continuing coverage. "I am delighted that the case is going to trial, and I lift up fervent prayers of hope that the courts will address the injustice that is being inflicted on future generations," Sawtell told a congregation in Wheat Ridge, Colo., last October. "I promise that if the case is not all over the headlines when it makes it to trial, that I'll keep you informed." In the months leading up to the trial phase of Juliana v. United States, a network of clergy, including Sawtell, has been preaching about climate change and invoking the lawsuit from the pulpit, often describing it as a positive note at a time when governments struggle to contain climbing greenhouse gas emissions. It's part of a campaign called Justice for Each Generation organized by the Rev. Brooks Berndt, the minister for environmental justice within the United Church of Christ, with help from the retired Rev. Dr. Jim Antal of Massachusetts, to galvanize support for the plaintiffs. "The case is compelling," Berndt said in an interview, adding that stories of the plaintiffs — 21 children and young adults ages 11 to 21 who say the government has denied them their right to a safe climate — help demonstrate why climate change should matter to individuals. "The case personalizes it for some in our congregation." The campaign's goal: Deliver 1,000 sermons nationwide that reference Juliana before and during the trial, which begins Oct. 29. Berndt and Antal, who served for decades within the United Church of Christ denomination, said they drew up the idea this spring. With just over two weeks to go before the trial, Berndt estimated the sermon tally has reached 150 to 200 since the campaign started. "The next week is when we're really going to do the big push," he said. The United Church of Christ has a history of progressive activism in environmental causes. In 2013, it was the first denomination to pass a resolution supporting fossil fuel divestment, and the church has its own fossil-fuel-free investment options. UCC takes a strong line on climate change institutionally, framing it as a scientific and moral issue. "The problems of climate change and global warming are confirmed and well-documented by the scientific community," the church says. "It is an issue of injustice between those who 'have' and those who 'have not.'" While the Juliana push began with UCC clergy — the mother of one of the plaintiffs is a UCC minister — at least 23 other faith groups, including Unitarian Universalists, the Shalom Center and Earth Ministry, have sponsored the program, according to its website. Karenna Gore, director of the Center for Earth Ethics at Union Theological Seminary, said climate change is a fairly common topic for faith leaders. And, she said, Juliana seems to be on their tongues. "I have a sense that that's in the conversation," Gore said. Religious leaders can draw climate change out of a political context and into an existential one, she said. "It's easier to get at it in faith-based settings when you're talking about air and water and soil, and not atmospheric science," Gore said. U.N. climate reports and peer-reviewed studies can be technical and weighty. "Everyone is aware that there is a different frequency or dimension of action when you talk about climate change in sermons," Gore said. "In a sermon, it's a chance to really go deeper, often into root causes." Lucia Silecchia, a Catholic University law professor, said religious communities have focused more attention generally on environmental matters in roughly the past 20 years. While Pope Francis is known worldwide for his writings on climate change, Silecchia pointed to a 1990 letter Pope John Paul II sent "solely" about environmental concerns. "I would trace the higher profile of environmental issues, at least in the Catholic community, to this letter and the many initiatives that it inspired," she said. Still, she said, Pope Francis' 2015 message, "Laudato Si'," was a stronger force to drive attention. "That encyclical was, I believe, a catalyst for greater attention to climate issues in the religious community," she said. Outside the pulpit, religious groups have written legal briefs in support of Our Children's Trust, the organizing body behind the kids' climate case. A Catholic organization filed a friend-of-the-court brief in support of the group's first federal lawsuit, said Coreal Riday-White, community engagement manager for Our Children's Trust. The organization is based in Eugene, Ore., where the trial is scheduled to be held in the U.S. District Court for the District of Oregon. Staffers are busy preparing for what they expect will be 50 days of proceedings. Riday-White said Berndt came to him last year, eager to help. "He was really keen on figuring out ways to spread the word about this case," Riday-White said by phone. Berndt wanted to create a project beyond the UCC network, he said. Aside from a few initial conversations, Riday-White said, the campaign spread organically. People involved with the sermon push will call, check in, ask legal questions — and then take matters into their own hands. "It's them — they're doing it," Riday-White said. "There have been some fantastic sermons that have come out of this." One California reverend used Juliana in a religious instructional session, he said. And Universalist congregations in Texas and Oregon wrote and performed skits about the case. The Rev. Dr. Robert Shore-Goss, now retired and living in Northern California, said he hopes this series of climate sermons will motivate youth to action. He recalled that climate was the most important issue to the students he taught at California State University, Northridge, behind employment and debt. "I applaud the voices of the young folks," Shore-Goss said of the plaintiffs. "This is the world that people are going to be facing." He added: "When the Earth is vulnerable, we need to speak up for the Earth." Antal, who led 350 UCC churches in Massachusetts before retiring, has been talking about the perils of climate change for a long time. He grew worried about climate change in the 1970s, and he has devoted much of his time on the dais to the topic since. He estimates he's given about 200 sermons over four years in which he's mentioned Juliana and Our Children's Trust — often as a point of hope. "I don't get into a pulpit without mentioning it," Antal said in an interview. He called the case "the most hopeful indication around climate change." 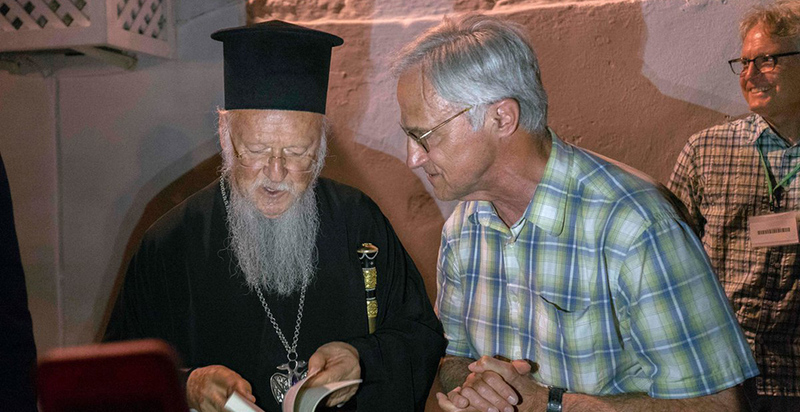 In June, he met in Greece with the head of the Eastern Orthodox Church, Patriarch Bartholomew, whom religious officials in the UCC community are trying to get to support the case. They're trying to get support from the Vatican, too. On an April Sunday at Old South Church in Boston, Antal spoke of the abnormal weather that battered the city this winter and spring. "In a period of only three months, January through March, Boston experienced its first- and third-highest-ever high tides since records began being kept in 1825," Antal, wearing a green bow tie and golden stole, told the congregation. After detailing the damage and cost of hurricanes and flooding in 2017, he turned to regions in the Arctic, Greenland and Russia, where temperatures were "50 degrees Fahrenheit above normal." Addressing climate change must begin with conversation, Antal said. "The first task is to end the silence," he said. He said there is still time to protect the planet. "Defiant hope inoculates us against the epidemic of despair that so often accompanies the release of the newest climate science or the shock when a government official denies it," Antal said. "The future is not yet written," he said. "God is calling us to change." A Mormon elder spoke about warming. Is the church shifting?